This intensive is for everyone who is alive and who would not say "no" to more aliveness. You will enter a supportive atmosphere which will powerfully assist you in fully being yourself. The title "The Passionate Spiritual Life, The End of Seeking, The Start of Being" says it all. As seekers we are passionate about spirituality and our lives. Anything else is death. Death has a place but not now, please. Spiritual life includes everything in your life including everything which exists. It especially includes your body and all of its natural functions, your family, relationships, work, eating habits and lifestyle. We are here to contribute our essence and beingness not to escape. This is not a creed - this is a fact. When you drop misconceptions then you will live from the space of effortless being. We are not to be seekers for life. Like being a baby, infant, teenager, adult and parent - these are stages to move through. Seeking is something to be passed through. It is like a rite of passage. The end of seeking is finding yourself. When you know yourself then you can act with certainty and fully play your part in human life. When you know yourself then you can start enjoying existence, your body, your relationships and the particular expression that your life's work, your vocation, your passion is to be. This intensive is for everyone who is alive and who would not say "no" to more aliveness. You will enter a supportive atmosphere which will powerfully assist you in fully being yourself. There will be time for questions and some form of stationary meditation or gentle moving exercises (Oshana Energy-Work Method). 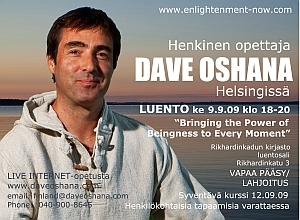 Eligibility: Open to everyone who meets Dave Oshana at the opening night teaching preview on Wednesday 09.09.09 Bringing the Power of Beingness to Every Moment (students who have attended recent intensives and retreats can apply by email but are highly recommended to attend the preview). Registration: Pre-registration is required. Register early enough to receive orientation, special guidance and preparation information. Preparation: You are strongly recommended to read and follow (as much as possible) the basic advice about Enlightenment Intensive Preparation and to listen to live, or replay, classes at DaveOshana.Com - by doing so you will familiarize yourself with the Teaching, and thereby absorb and integrate as much of the experience as possible when you attend the teaching events. Orientation: Full orientation information will be emailed at least 2 days before the event to those who are registered.